> Blog > Motor Vehicle Accidents > Pedestrian Accidents > Will New Bicycle Lanes in Portland Decrease Accidents, Increase Traffic? Will New Bicycle Lanes in Portland Decrease Accidents, Increase Traffic? The city of Portland is currently working on a project that will remove some lanes of vehicle traffic throughout the city in order to construct new bicycle lanes on busy roadways, including on Northwest Everett Street and North Williams Avenue. Increase the safety of all people who travel on these roadways (including motorists, bicyclists and pedestrians), as bicycle and motor vehicle accidents resulting in injuries could decrease by as much as 50 percent when bicycle lanes are up and running on these highly traveled roadways. The development of more bicycle lanes in Portland may end up decreasing the number of motor vehicle accidents and improve the safety of everyone on the road. Various studies that have focused on the impacts of bicycle lanes on New York City’s streets have underscored the safety and economic benefits of having these designated bike lanes on such busy thoroughfares. In NYC, the construction of bicycle lanes triggered a 56 percent decrease in injuries to all people who traveled on these streets. Specifically, while the people riding bicycles saw a 57 percent decrease in accidents and injuries, pedestrians benefitted from a near 30 percent reduction in accidents and injuries. 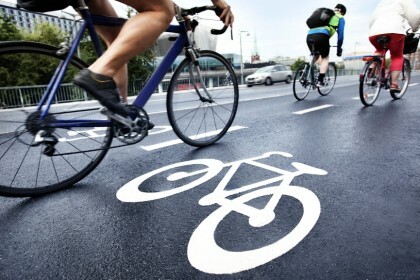 While the installation of bicycle lanes generally increased the number of cyclists on the roadways, it did NOT result in an increase in bicycle versus car crashes. The presence of bicycle lanes in NYC resulted in substantially less sidewalk riding and less cyclists riding with cars in traffic lanes. Additionally, passenger vehicles on the roads tended to slow down (i.e., not speed), and the overall traffic flow improved. These findings seem to bring good news and support Portland’s efforts to create new bicycle lanes on busier streets in the city. Have you been hurt in a motor vehicle accident? If so, the Portland motor vehicle accident attorneys at the Savage Law Firm are here for you. Since 1977, our esteemed legal professionals have been devoted to providing each of our clients with personal attention, respect and the highest quality legal services. Helping you recover from the financial setbacks caused by motor vehicle accidents is one of our primary goals. Our Portland accident attorneys encourage you to learn more about your rights and case by setting up a free initial consult.